An HBO Western drama set in the 1870s in Deadwood, South Dakota. Created by David Milch, the series is known for its heavy use of violence and profanity while storylines are often a mixture of historical and fictional events. 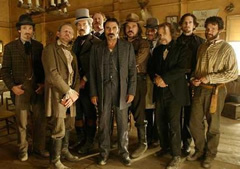 Historical figures featured include Wild Bill Hickok, Seth Bullock (Timothy Olyphant), Sol Star (John Hawkes), Calamity Jane (Robin Weigert), Al Swearengen (Ian McShane), Wyatt Earp (Keith Carradine), E. B. Farnum (William Sanderson), Charlie Utter (Dayton Callie), and George Hearst (Gerald McRaney). Greatest show of all time. 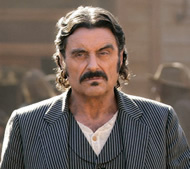 Alot of People are Still Waiting For The Return Of Deadwood..Is HBO Going To Do The Return..>?? Please tell me why the language of that time cannot be used when you seem to try & get most of the facts right. I notice this in all movies. Do you think we will not know the curse words of that time period? I think the writers do not know the curse words of that time. 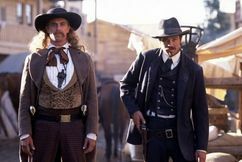 Series would have been better with the correct language of the late 1800.
now the new milch cop drama is cancel after only the pilot he can do deadwood movie i hope !